Students and people who make use of the library of CSI Higher Secondary School for the Deaf, San Thome, will soon get a new reading space – this is in the garden area, opposite the school library. The reading space has been created by using palm trunks and the school is planning to fix stone benches shortly. 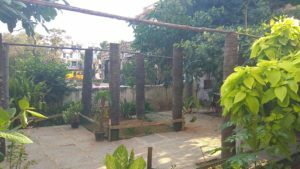 “The library took its shape last year after ‘Mylapore Times’ newspaper published a report on the idea of building a library. We received many books from people which were more than enough to build this library,” he says. Now, the library has over 6000 books, all donated by people. There are books for all age groups. Different genres of books – short stories for children, science fiction, spirituality, psychology, literature, competitive exam preparation books and more are available here. The library is open to the public too. “But, we need donors to complete the construction of the roof for the new reading space.We welcome donors who can provide the construction material as well,” says James. People who wish to contribute towards this project can contact the school headmaster James Albert at 9962061559. This entry was posted on Thursday, April 11th, 2019 and is filed under Community, Schools. You can follow any responses to this entry through the RSS 2.0 feed. You can skip to the end and leave a response. Pinging is currently not allowed.